He has only held series of exclusive invitation only presentaions for his famous brand since his tentative return to London over the last few years. 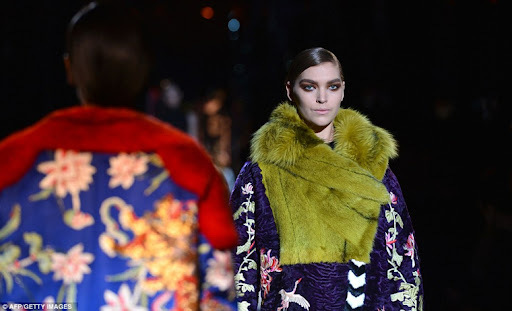 But yesterday, Tom Ford marked his very first full-fledged London catwalk show as a part of LFW. Held in the elegant confines of Lancaster House in St. James (a stone throw away from Buckingham Palace) a venue usually used for international diplomatic conferences, the elegant show hosted the likes of Vogue editor, Anna Wintour and Justin Timberlake who sat side by side in the front row with chandelers and gold-painted ceilings overhead. The collection was a combination of brightly coloured sequined jackets, spider-web lace worked into short and long skirts, soft black leather jackets with fringes in the back, leopard-printed and bright pink fur coats. 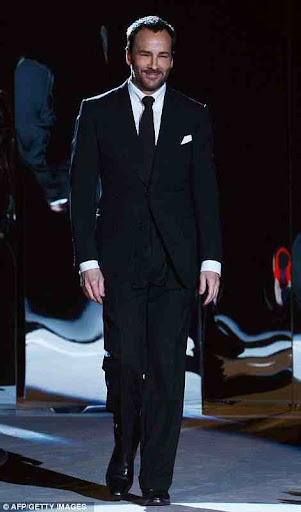 He made a brief apperance at the end of the show wearing one of his signature slim-cut black suits.